Our new quarterly newsletter publication aims to communicate with our members news, interviews and events that are of interest to people in the field of Hypertext and Hypermedia. 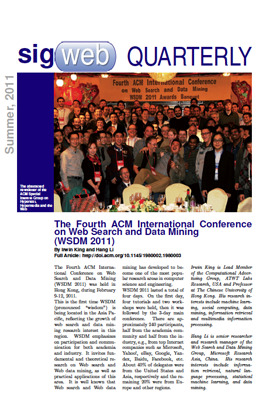 An archive of past issues of the newsletter, in digital form, is available through the ACM Digital Library. SIGWEB's strength has always lay in the willingness of its members to volunteer and foster a community spirit. In a similar fashion, the newsletter is written for our members by the efforts of our members. Below we provide templates for both Latex and Word users. If anybody has any news, thought pieces, or event that may be of interest to the community, please use these templates below and submit your newsletter article to the SIGWEB Newsletter Editor, Jessica Rubart. The SIGWEB Newsletter Editor, Jessica Rubart.